When it comes to setting up your own website, the hardest task comes at the beginning: choosing the theme. We’ve seen this one task delay entrepreneurs for days if not weeks! Sometimes people just give up, close their eyes, and pick one at random. But that always leads to regrets and headaches later. We’re thrilled to say there’s now an easy guide by one of our guest posters to make choosing your theme easy. This is a subject everyone wants help with but there’s no help available…until now. Barbara took her years of knowledge working as a brand designer to write this short but insightful guide that answers all your questions (like what is the difference between a theme and a child theme?) and allows entrepreneurs at all tech levels to pick a theme that fits their skills AND their needs. What makes Barbara’s e-book unique? Worksheets! Barbara not only tells you what key things to consider when choosing a theme (like customization, support, and features) but she made a set of worksheets so you can identify what your unique site needs. This really helps you hone in on your choices and eliminates a lot of wasted time. Graphs! Barbara includes three full pages of graphs that break down the most popular free and paid WordPress themes. Coupled with the worksheets, you can match your needs to a popular theme in minutes! 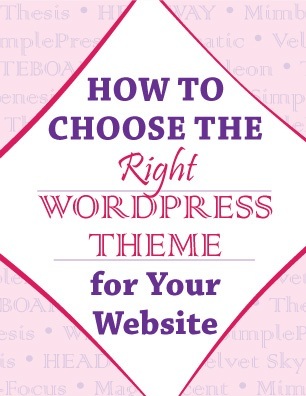 If you’ve made the decision to build your own website but got hung up on picking a theme, How to Choose the Right WordPress Theme is a great e-book to help you make that difficult decision. Picking the right theme early on sets you up for years to come and ensures you don’t have to make a difficult theme switch later. If your current theme isn’t doing all that hoped, Barbara’s book is a great resource to help you pick something that fits your website and your needs.